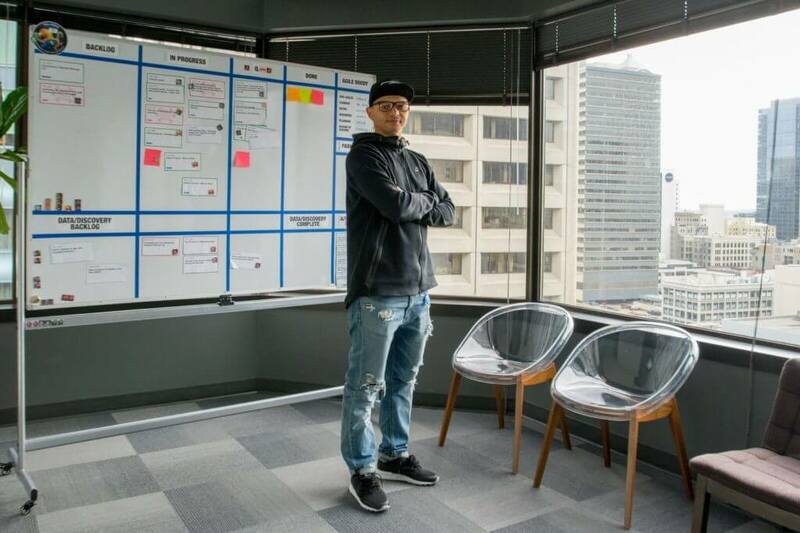 In honor of National Apprenticeship Week November 13 – 19, we’re proud to highlight Shawn Farrow, a software engineer here at Avvo, who kick-started his engineering career through Apprenti, a Seattle-based apprenticeship program. After you read the Q&A, be sure to check out this article for additional information about Shawn and Apprenti. You came to Avvo via an apprenticeship through the WTIA Workforce Institute’s Apprenti program. What was the program like and how did it prepare you for your new role as a software engineer? The program is awesome. First, I went through training at a coding boot camp that taught me a lot of the basic skills to get me started. Once training was complete and I got on-site, I was set up with a mentor to learn from, get help from when needed, and I was able to grow as a developer. I highly encourage anyone interested in technology to check it out. What is your favorite part about working in downtown Seattle? My favorite part is having access to everything. If I need to go to the bank, want to go shopping, or meet a friend for lunch, it’s all downtown. What was your initial perception of the legal industry, and how has that perception changed since coming to Avvo? Before Avvo, I had a naïve idea of what lawyers do, or anything about the legal industry at that. After working here, I now know that there are millions of people in America just like me who need some sort of legal help. I’m glad to help people get the information they deserve. What is one of your favorite new technologies? Right now I am digging into Vue.js. It’s something that my team is looking to move towards and I need to be on my game. What’s it like working for a tech company in one of the top tech cities in the nation? It’s cooler than I thought it would be. I’m making an impact on people’s lives through technology, meeting cool people, and learning from my super smart peers. That inspires me to come to work everyday. Has anything about Avvo pleasantly surprised you since your arrival? I’m always surprised at how willing people are to help. As a junior developer, in the first year of my career, I need a lot of assistance and no one has made me feel like I shouldn’t be here. I’m inspired by many people for many reasons. My biggest inspiration is my big brother, Dwight. He is one of a kind and walks to the beat of his own drum. Many of the lessons I’ve learned in my life came from him when we were growing up. I wouldn’t be who I am today without him. What advice would you give to someone just starting their career? Be genuine, respectful, work hard, and ask for help. I emphasize the “ask for help” part. I believe if you do these four things consistently then the technical skills will fall into place. I think we get too caught up in the technical skills when we’re starting out. I’m not really into shows and when I am watching TV I usually turn on something sports related, but I did just start the second season of Stranger Things. I mostly listen to Hip Hop at work, with some R&B mixed in depending on the mood. Most recently, I listened to Kevin Gates and Lihtz Kamraz. My phone. I use it for all things important: checking the time and listening to music. And of course, there’s the other things like checking email, phone calls, texting, my calendar, the internet, social media, playing games, and taking photos.